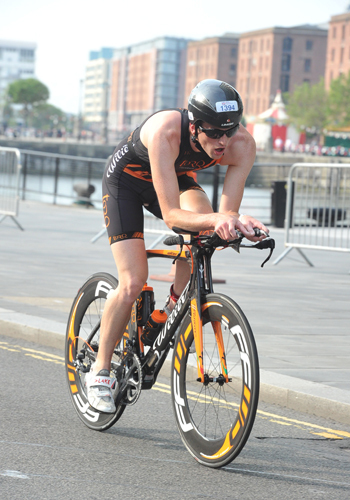 Chris Standidge: Liverpool was the venue for the British Age Group Olympic Distance Champs, but also the final qualifier for the World Champs in London, so competition was always going to be fierce. I had raced this venue back in 2009 coming 3rd in an Age Group Elite Wave in 1:57 so knew the course well. Back then, the number of competitors was quite a bit smaller so drafting wasn’t such a problem, but on a 4 lap flat bike course with 2000 competitors, I wondered whether this was the right course or not to hold on such a big race. However, sometimes you just have to get on with it and just do your best under the circumstances. The 2 weeks prior, the weather had been fantastic and there was even a small chance of a non-wetsuit swim. In the end, the temperature fell just short of the 22 degrees required, so wetsuits it was. It was an early start for the 30-34 and 35-39 age groups at 7am – not great for the 4am get up, but with the temperature forecast to be up in the high 20’s it meant we were done just after 9, so probably had the best conditions on the run. 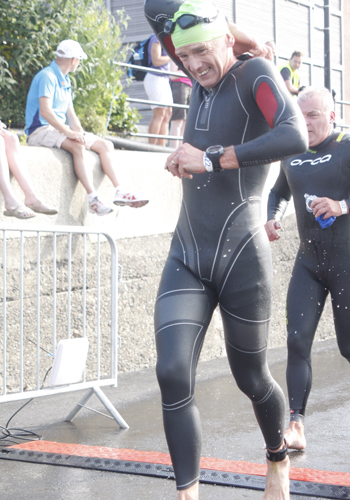 I got a good start on the swim and soon there were just 2 of us slogging it out at the front of the wave for the 1500m. In the last few hundred metres we had started to catch some of the wave ahead and just got parted a little, as we made our way through the swimmers. So I entered transition in 2nd place about 10 seconds back, had a quick transition and we both headed out on to the bike together. Straight away I was on my own and getting into my rhythm. My plan was similar to the one I have used for most of the season – swim and bike hard and then just give what I have on the run. Two laps into the bike, a pack of 15 to 20 had formed about 15 secs behind me. I had seen packs all the wave through the bike course on each of the turnarounds, but what was frustrating me was that I working on my own and giving everything, but not making any ground on those in that pack. Even though I knew there was nobody from my age group that close to me, it made me think about what everyone else was doing. Were there others from other age groups that could be fighting for the overall getting pulled along in a pack and then because they had fresher legs, pulled off a faster run split than they would normally? I definitely lost my concentration on lap 3 and then I thought I already have my World Champs slot, I have nothing to lose so managed to get back on track on the last lap and entered transition. The run was a flat out and back 2 lap course. There were runners all over the course by this stage, so it was difficult to gauge where people were in the overall positionings. All I knew was that I was winning my age group, but if I wanted a good overall place I would have to give everything I had and just wait to see if anyone went faster. I had a pretty solid run, never really dropping pace from the first mile and finished the run in 34:15. My overall time was 1:55:21, and I was 30-34 British Champion. I was extremely happy, but then it was a long waiting game to see about the overall. I knew I had gone faster than the 35-39 age group but realistically I had to wait for the 20-24, 25-29 and 40-44 winners before I knew. It was close, but in the end I had the fastest time of the day by just 6 secs to the winner of the 25-29 age group Alex Lawton, so I became British Age Group Champion. This is probably my biggest win in a lot of years doing triathlon and has been part of my most successful season. What has changed? Probably not a massive amount, I have been there or thereabouts in Age Group Racing for a while. I have definitely trained more consistently this year and been that bit more focused. I have been able to move everything on just a little bit, but predominantly my biking, and it’s just been enough, so that rather than Top 3’s or Top 5’s in races, I have been able to win a few major races. I am very lucky to have some very good training partners who have pushed me to new levels and some very good sponsors who keep me racing in the best kit. 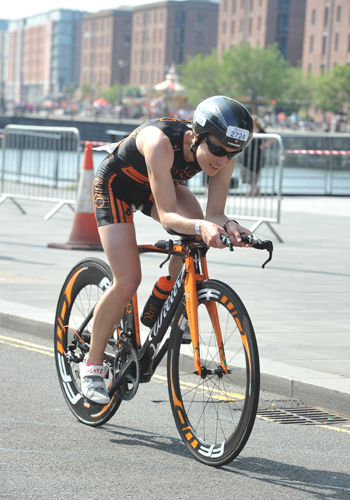 Danielle Stewart’s report: It was always going to be tough racing the first combined British Triathlon Championships in Liverpool, especially since it was the last qualification race for the World Championships in London. It certainly lived up to expectations and I can definitely say it was the best field I have competed against in a UK-based triathlon! 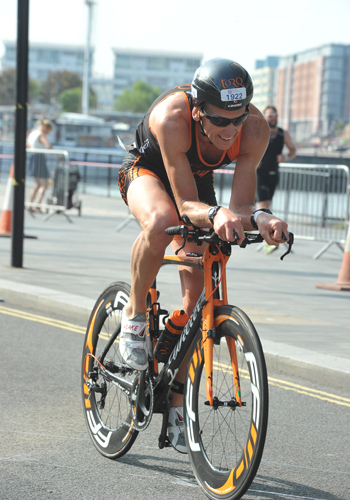 Having raced at the Dambuster Triathlon only a few weeks earlier, I was hoping to improve on my performance and start to get a feel for where general improvements need to be made in the lead up to London. It was a very hot day with temperatures close to 30 degrees, but the water temperature erred just on the side of a wetsuit-legal swim. Standing in the waiting area I was starting to feel like a boil-in-the-bag dinner in my wetsuit and have never been so pleased to climb in to the water at the start of a race! I decided to stay out of trouble after feeling slightly battered in the swim at the last event, so I positioned myself at the end of the pontoon. The gun went and we were off –I soon realized we were swimming through swarms of jellyfish! Even more of an incentive to get out of the water quickly! I knew I would be behind after the swim as it has been a while so I was pleased that T1 was a lot less clumsy than last time. The bike course was fast and fairly flat and I got to working hard on the Twinblade to make up some time. I felt quite good on the bike and started to pass people, although I do need to practice dead-turns (sorry to the guy I nearly took out on the 2nd turn)! T2 was smooth and I was on the run course before I knew it. I felt surprisingly good off the bike and relaxed in to my run. I passed a few more people on the run course and was happy to settle in to a comfortable pace. I was pleased with a 35:30 split, especially given the hot conditions. I crossed the line in 4th in my age group, which I was very happy with. I felt like I had a much stronger race than at Dambuster. 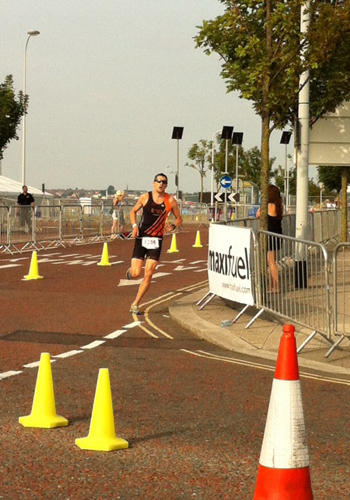 Hamish Shaw’s report: Liverpool Triathlon, British Standard Distance Championships and my last chance to qualify for the World Championships this year. If the competition was anything like as tough as it was at the National Sprint Championships, I knew I would have my work cut out. Registration was the evening before the race. This can be a bit frustrating with no registration on the day especially as I only live a 40 minute drive away and wouldn’t want to stay over in a hotel. However, I used the opportunity to have a wander around the race venue to get my bearings for the following day. I had a look at the swim route and the massive transition. There would definitely be no records set in T1 or T2 in this race. It was a fairly early start on race day with my wave starting at 7:30am. The start was in water whilst holding on to a plastic, jigsaw type pontoon. There was time for a short warm up in the water which was a very pleasant 21 degrees. With a minute to go we were all ushered back to the pontoon. I figured out that I could twist myself in such a way that I could get one foot on the pontoon out of the water for a push off. I only noticed one or two others spot this. It definitely gave me an advantage when the horn sounded. A hard push off and I was in clear water immediately away from any of the melee. I found a pair of feet to follow. I saw two swimmers further ahead but held station. After about 900m, I felt my ankle niggling away and eased off on the kicking. I knew I would lose some time because of it, but hoped I could gain some places back on the bike and run. I exited the water in a group of four athletes and set about getting through a giant transition zone with a swim time of 20:56. I had walked the transition before the race and noted that the aisle my bike was racked on was adjacent to the last British Triathlon sign on the edge of transition. After collecting my bike there was a run of about 400m until the mount point. I put a sprint in for the last few hundred metres and crossed the line in a time of 2:02:15. My run split was 36:54 which is the quickest 10k I have done in a triathlon and good enough for a qualification slot at the World Championships. 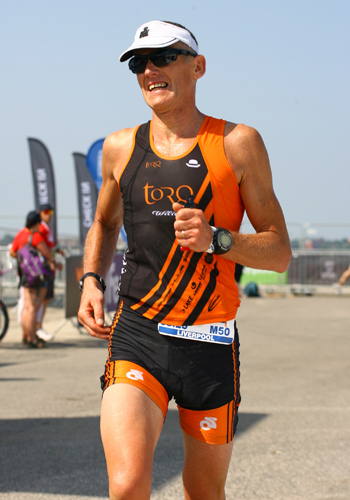 Dave Mawhinney’s report: I knew that the Olympic National Championships at Liverpool would be a very competitive race throughout all the age groups, but having done more speed work over the last month I was hoping that I would be able to qualify for the World Championships in London in September. With there being 129 people in my 50-54 age group and an even split into 2 swim waves, I realised that it would be tough to qualify for London. My 8:25 swim start went smoothly and it was easy to find clear water on the swim course. Even though it involved a number of turns, sighting wasn’t a problem in the calm conditions. Into T1 and out onto the first 10 km lap of the 4 lap bike course. With over 2500 people taking part in the event, split up into multiple swim waves, I was expecting the bike loop to be very crowded, but it was easy to push hard and also to avoid drafting on the fast loop. 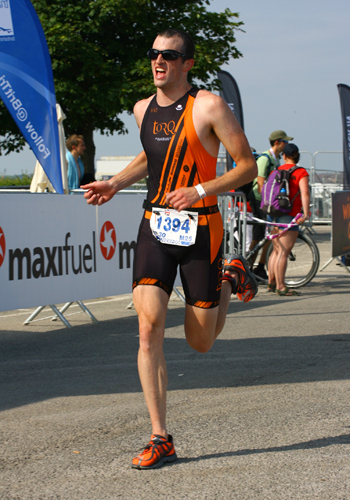 I was mindful to keep well hydrated in the hot condition sand entering T2 I was pleased with my 1-01 bike time. Out onto the 2 lap 10km run and the temperature was getting very hot, but my legs felt strong coming off the bike and I tried to pass people in front of me from previous waves to try and spur me on. With the heat reflecting off the buildings around us, it was hard keeping a rhythm in the heat and I was relieved to reach the final turnaround point and head to the finish. On seeing the results my fears had been proved right I was outside of the qualifying positions for London. But the positives to take away from the event were a good bike and run time showing the speed work has been starting to pay off. I’ll be going back to long distance next year with the hope of another Ironman distance age group win and finishing this season at the Vitruvian a half Ironman distance event.